What is In Home Supportive Services (IHSS)? What is the Public Authority? What is the Public Authoritys role within IHSS? Does the consumer have any control in choosing a provider? How is IHSS funded and administered? Who Pays for IHSS consumer services? How can I find out if I qualify for IHSS? How long will it take before I know if I qualify for IHSS? What happens once I am qualified to receive IHSS? Who determines how many hours the provider can work? What happens if I am not satisfied with the provider I hired? What will I do if my income is too high to qualify for IHSS, but I need a health care provider? The In-Home Supportive Services (IHSS) program is, and will continue to be, Californias largest and most important in-home care program. 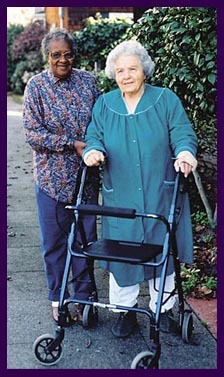 The IHSS program provides personal and domestic services to aged, blind or disabled individuals in their own homes. Individuals who perform these services are called providers. Individuals who receive these benefits are called consumers. The purpose of this program is to allow the consumers to live safely at home, rather than in costly and less desirable out-of-home placement facilities. IHSS pays providers (also called home care workers or personal care assistants) to provide personal care, such as feeding and bathing; transportation; protective supervision; and certain paramedical services ordered by a physician. Providers may also perform household tasks for consumers such as laundry, shopping, meal preparation and light housecleaning. The Public Authority is the employer of record for IHSS providers. The Public Authority is mandated by the State of California. It is separate from the county and has all the ability to carry out the delivery of in-home supportive services. The Public Authority was created specifically as a program improvement for consumers and providers. Public Authority services are provided at no cost to consumers and providers who meet specific qualifications. The significant role the Public Authority fulfills for IHSS is to offer services that assist consumers with greater access to providers. This has been accomplished by creating a provider registry. A provider registry is a computerized data base listing qualified and screened IHSS providers. These services offered by the Public Authority provide consumers with a greater level of confidence when hiring providers. Aside from establishing a registry, the Public Authority is also responsible for: 1) investigating the qualifications and background of potential providers, 2) establishing a referral system to connect providers with consumers, 3) providing for training for consumers and providers, 4) performing any other function related to the delivery of IHSS. Yes, while IHSS regulations determine the range of services, it is the consumer who drives the program. The consumer decides how the authorized services will be provided. The consumer is entirely responsible for hiring, supervising, and if necessary, terminating individual providers. The Public Authoritys role is to improve the quality of service without interfering with consumer control. IHSS is financially supported through a complex combination of federal, state, and county funding sources. IHSS social workers determine consumers program eligibility, including the number of hours and type of services each consumer requires to remain safe in their home. To qualify for IHSS, individuals must meet specific income and disability requirements. Services are provided without cost to Supplemental Security Income and/or State Supplemental Payment consumers. If you are a resident of Butte County, you can contact IHSS intake by calling 530-538-7538. IHSS social workers meet directly with the consumer and evaluate what the consumer can and cannot do safely for him/herself. It is important to stress that the IHSS program is based on a social model  one that relies on social worker assessment. The social model focuses on activities of daily living and the ability of IHSS consumers to function safely in their own homes. The application process can take between 30-45 days, depending on each individual case. In many cases, the consumer must also apply for Medi-Cal. Emergency situations are priority and are processed immediately. The consumer will hire the provider of his/her choice. If the consumer does not have a provider, the Public Authority will assist in this process. Upon request, a Public Authority Services Specialist will supply the consumer with a list of screened providers. The list of providers will be appropriately matched to each consumers particular needs. The consumer can then interview prospective providers from this list and hire the one they prefer. An IHSS social worker will determine exactly how many hours of service per month each consumer is eligible to receive. The hours allotted will depend on what activities the consumer can no longer do safely on their own. The consumer should be fully comfortable and satisfied with his/her provider of choice. If for whatever reason a provider needs to be replaced, the consumer, as the employer, has the ability to terminate that provider and hire a different one. Consumers with higher income may be eligible for the program by paying a share of the cost of services. Consumers who do not qualify for IHSS will be referred to an agency which can assist them in finding a private provider. If you do not qualify for IHSS, click here for a list of private local agencies that can assist you. Copyright © 2006 Butte County In-Home Supportive Services Public Authority. All Rights Reserved.